Flood victims line up for help but cracks appearing in how disaster is being handled. It is unfortunate that people fail to understand or realise the enormity of the communicable disease problem in the west in the wake of the recent floods. While it is true that Joeli Cawaki is a military man - it is also true that people are dying from diseases because people living in flood affected areas are taking panadol rather than visiting the nearest health centre or hospital when they develop fever. They are then rushed to the nearest hospital when the constant ingestion of panadol does not do the trick but by then it is often too late. This is where Joeli Cawaki is coming from. People have to be made aware that at the onset of flu-like symptoms - they must present themselves at the nearest health centre or hospital immediately. Case in point - the young lady (one of 500 evacuees taking shelter at the Lautoka Girmit Centre) who took herself to the Lautoka Hospital on Wednesday two weeks ago. What happened there Peni Namotu? And why isn’t the Ministry of Health commenting about what happened to this unfortunate 28 year old young woman, a mother of one? Joeli Cawaki knows that dengue and leptospirosis are treatable if people are given the right medication at the onset of these diseases. 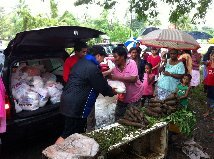 He is simply doing his job and taking responsibility while others seek to comment from the warmth and comfort of their homes in Suva. I look at Peni Namotu's picture in this blog, I see ignorance, inexperience, subservience and poserlessness written all over his face. He is just a mouthpiece who releases whatever his bosses tell him to say. THE CULPRITS IN THIS POST FLOOD HEALTH DEVASTATION SAGA IS THE MINISTER OF HEALTH, HIS PERMANENT SECRETARY AND SENIOR HEALTH OFFICIALS IN THE WEST. These are the people who should be held accountable in this matter and PM Bainimarama should act immediately on this. Anyway Joeli Cawaki is a practical man who is doing what is best for the division. And this should be brought to the attention of the WHO Director who is currently in the country and last night on TV heaped praises on the Ministry of Health. But then he was seen on TV sitting in an air conditioned room, enjoying coffee and snacks while watching a presentation by Health officials. And the reality is that villagers in the west are wading around in knee deep mud trying to feed their families. The buck ends with liuliu ni Mataivalu ni Solisona - VB. I'm sorry? This post is confusing (or was it intended to be?). We and those sitting in comfort in Suva "should thank Joeli Cawaki for taking responsibility and condoning the treatment of dengue and leptosprirosis with PANADOL?" And we should also thank them all for this grande phuck up and self-preservation from all quarters of the bureaucracy? Where are those christians saying we should pray and turn the other cheek? Do we continue turning the cheek to Bai? Spending all the money on soldiers and none on Health. May be we do nothing. Let's just ignore it. Turn the other cheek. Let Bai do whatever he wants with our money. Let the children die from diarrhea. What do christians suggest we do to Bai and his soldiers? What are we going to preach in church next sunday? The problem here is basic - it is the failure of the system. Fiji is currently run by an illegal regime. It is illegitimate and lacks support by the world community. As a result when the country is faced with a natural disaster there is no support or assistance forthcoming from our traditional friends, and even our new friends like China, Russia and India. The country is being mismanaged as shown by its poor economic performance since the time of the coup in 2006 which is shown by negative economic growth for 5 years in succession now. The economy is weak then and totally dependent on one industry alone - tourism. The illegal regime cannot and will not allow any disruption to tourism at any cost even if peoples lives are at stake like in the Western Division where many are suffering from various types of diseases as a result of inadequate sanitation following the floods. The regime is not prepared to declare a health emergency in the West because it is worried about how the negative publicity coming out of it will affect tourist arrivals into Fiji. So the regime is prepared to sacrifice the lives of locals - they are probably not much concerned because only Fijians are dying and not Indians - for the sake of receiving misely sums of money from tourists. This is a clear case of putting priorities in the wrong order which reflects ignorance and poor leadership. I say to fix the problem, we must fix the system. The system needs to be get rid off. Remove the illegal regime, and its leadership. 13:44 Today on FBC (he says nothing will be done until numbers triple!! The Health Ministry will only implement the Public Health Emergency in the west if the number of confirmed cases of typhoid, leptospirosis and dengue triples says Permanent Secretary Dr Eloni Tora. Dr Tora says many of the confirmed cases were already in existence before the floods and there hasn’t been many cases recorded after. He says before the floods there were 18 confirmed cases of typhoid which has increased by 2 to date, dengue had 16 confirmed cases before the floods and this number has only increased by 6 to 22, while leptospirosis had 27 confirmed cases before the flood and now stands at 28. He adds, the 62 confirmed cases spreads throughout the Western division and if implemented, the Public Health Emergency will see a total lock down in the western division. This he says will severely affect businesses since movement will be restricted. Dr Tora says what they have done is increase their teams in the west to ensure the diseases are contained. Remove the Vuaka. How? All you lamusona Fijians are doing is venting your anger in this blog, yet the Vuaka is still making a lot of money from his corrupt cronies. The military consisting of cowards are simply following the pig Bai like lost souls. They have no feelings for ordinary Fijians. It only takes one true soldier to put a bullet right between Vuaka's eyes, problem solved. The person who will do that will go down as a hero. Any takers? Anyone who assisinates Voceke will be killed or will get death sentence. Leaders of the world flock together. Now the last thing they want is asainations to become contagiuos, after all there a quite a few that the world wouldnt miss. Remember how there was moral outrage when Ghadafi got his. Military is military. The RFMF only have one expertise; ineptitude and killing people. They are doing both of those very well. of houses and cars,on the airplane and every boat in that country!So go ahead and try it?Well do the same for you? @ annon 902pm, go copulate with your boss, drau boci, you think you have the galls to threaten us, try mada and you will find out how much we hate you MF's, got that. @ annon 757pm...I'll do it for you loud mouths on this blog. dicktator? We'll start from the top and move on down the ladder as per seniority? There going to be a lots of dashes throughout that Cassava patch?By the time we're through it certainly will be the cleanest cassava patch this side of the dateline! Not so, Frank for one will be shitting his pants as he runs along ! It might just be the shittiest cassava patch ! Main issue here is political not medical. A large proportion of Viti's civilian population are at risk - some have already died - yet overseas military medical teams & facilities are banned. Now there's a unique brand of top brass military thinking for you. How can we see growth in our economy when we have an uneducated person as our Finance Minister. All over the world the CFO of a company and more importantly the Finance Minister of a country must have degree in financial management with a lot of practical experience to go with it. In Fiji, anyone who can use a gun is qualified to be the country's CFO. I think Eneri might do a better job.